For more information, visit the Cookie Information section. In 2004 we had a simple idea: bring our professional and artisanal bakery know-how into every foodie’s home. Thanks to the work of our Research and Development Laboratory, we create bread mixes, dried sourdoughs and flours to bake natural products from good and selected ingredients. From the beginning, Ruggeri has been following a Clean Label philosophy: we use only natural ingredients, free from Mono and Diglycerides of fatty acids or chemical emulsifiers. That's why we are a “Flours Laboratory”: every day we test the best raw materials to obtain natural, healthy and tasty baked products. With our mixes for bread, pizza and cakes you save time without compromising the quality of the raw materials and the final result. Our products follow today’s food trends, which allow the consumer to follow a healthy but always tasty diet. 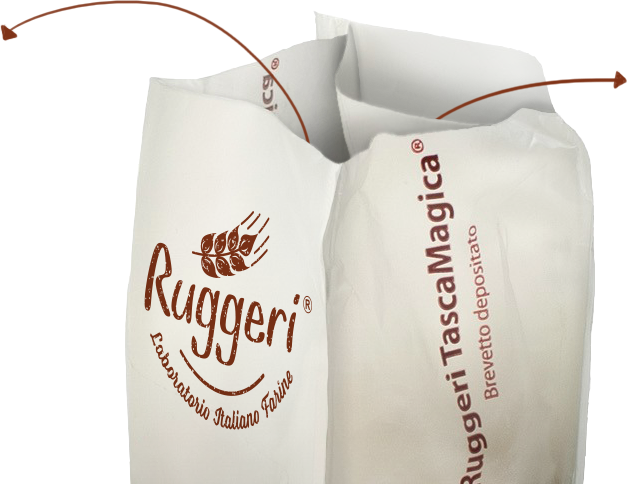 Ruggeri mixes for bread, pizza, pasta, focaccia, cakes give the possibility to obtain a professional result at home. Practical and versatile, they are perfect for classic baking recipes or for your creative cooking experiments. Many of our mixes are complete, so they do not require the addition of other ingredients. Just add the right amount of water. Ruggeri bread and pizza mixes can be used both with hand preparation and with bread machine. Always looking to innovation, we have registered the trademark for the packaging solution Ruggeri Tasca Magica® (Ruggeri Magic Pocket). Thanks to two internal compartments, it separates the yeast from the flour. This allows store the ingredients for longer time, without using chemical preservatives. The Magic Pocket in fact maintains the organoleptic characteristics of the raw materials, such as fragrance, flavour and fermentation activity. It also prevents the decay of the yeast: if it comes in contact with the flour, the fermentation process begins. In this way, the flour remains pure, with its 100% leavening potential. With the convenient and practical Magic Pocket, you pour all the ingredients you need directly into the bowl, without having to worry about checking the right doses or weighing the yeast. Free shipping for orders over 49,00 € (only for Italy). For orders on the national territory, a contribution of only 6.99 € is requested, special price is reserved for amounts over 20,00 €. Shipping- abroad, Shipping costs for all other countries are calculated based on the destination and weight of the order. You can pay your orders by credit card through PayPal or by swift bank. Read reviews from others and share your experience. Go to the product pages you've bought and leave your feedback. Subscribe to our newsletter to be informed of all promotions and recipes! Natural ingredients, imagination and simplicity. Everything you need from the Mediterranean cuisine, attentive to the values of a natural, healthy nutrition. A philosophy of life aimed at a healthy and nutritious diet. A great passion for flavours, scents and colours of the Italian tradition. We select only natural ingredients and create simple and genuine products. We do all this for your well-being, having the best of life every day ... Try our recipes, you will discover our world!